Purchase your 1 oz 2018 Nieu Czech Lion silver coin from our online store at the most competitive price. This coin is the second release in the Czech Nationhood series, minted by the Czech Mint and meeting international bullion coin standards. Th reverse feature is that of a proud and intricately fashioned lion, guarding the crown and shield of of St. Wenceslas; the lion is easily identified as the herald who features on the Czech coat of arms, and is the only lion with two tails. The Czech lion is joined on the reverse by the coin's weight and purity, as well as the Czech legend. The coin's obverse features an equally detailed rendering of Elizabeth II in profile, set over another recognizable symbol of the Czech nation, the linden branch. Also on the obverse, Elizabeth II's name, the Niue Island legend, the coin's year of release and its denominational value. The esteemed designer of this coin's immaculate features, Jaroslav Bejvl, passed away shortly before completion of the design, at the age of 75, after which the design was finalised by the skilled young artist, Asamat Baltaev. Diversify your holdings with this meticulously realized tribute to Czech pride and order your 1 oz Nieu Czech Lion silver coin today. צד אחד A two tailed lion on guard holding the Czech coat of arms. הפוך Effigy of Queen Elizabeth II and the words "Elizabeth II Niue one Dollars"
A two tailed lion on guard holding the Czech coat of arms. Effigy of Queen Elizabeth II and the words "Elizabeth II Niue one Dollars"
1 oz 2018 Niue Czech Lion Silver Coin Purchase your 1 oz 2018 Nieu Czech Lion silver coin from our online store at the most competitive price. This coin is the second release in the Czech Nationhood series, minted by the Czech Mint and meeting international bullion coin standards. Th reverse feature is that of a proud and intricately fashioned lion, guarding the crown and shield of of St. Wenceslas; the lion is easily identified as the herald who features on the Czech coat of arms, and is the only lion with two tails. The Czech lion is joined on the reverse by the coin's weight and purity, as well as the Czech legend. The coin's obverse features an equally detailed rendering of Elizabeth II in profile, set over another recognizable symbol of the Czech nation, the linden branch. Also on the obverse, Elizabeth II's name, the Niue Island legend, the coin's year of release and its denominational value. The esteemed designer of this coin's immaculate features, Jaroslav Bejvl, passed away shortly before completion of the design, at the age of 75, after which the design was finalised by the skilled young artist, Asamat Baltaev. 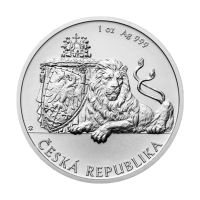 Diversify your holdings with this meticulously realized tribute to Czech pride and order your 1 oz Nieu Czech Lion silver coin today.